The Navy's Kesselring Site NNPTU has hit a significant milestone; it has graduated its 50,000th student. A number of reports are out on this in national and local levels. Wall Street Journal article online. Hudson Valley / Your News Now report with video and interview of 50,000th sailor. The Kesselring Site is one of two prototype sites at which Navy personnel receive hands-on training in nuclear power. The other is located in Charleston, South Carolina. There used to be two more, which are closed down; the NRTS Navy facility in Idaho, and another site in Windsor, Connecticut. In the reports above a massive spherical containment can be seen. 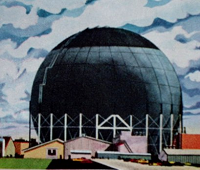 This is the containment built for the S1G originally and is the largest spherical nuclear power plant containment vessel ever constructed anywhere. 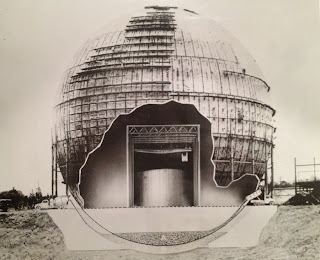 This sphere is 225 feet in diameter, and is thus larger than those built for Dresden 1, Garigliano (Italy), Yankee Rowe or any other. 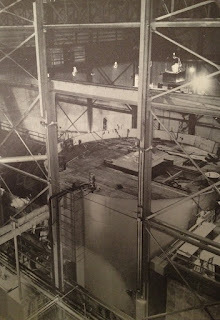 Below we see, from APR's collection, a January 1954 United Press photo, with original caption below, showing the sphere under construction with some detail airbrushed in. The working part of the prototype, namely the hull section and a submergence tank, was shown quite clearly in the contemporary film "The Atom Goes To Sea" produced by General Electric. In that film, the structure is shown being "launched" by being moved from outside the sphere, where it was constructed, to the inside. (This film is widely available now on a number of DVD's.) 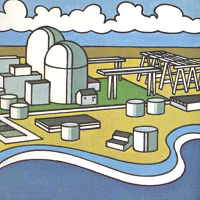 Below, an illustration from the unclassified advertising / PR booklet titled "Knolls Atomic Power Laboratory" published by General Electric ca. 1958. The caption for the above photo is as follows: "Hull and submergence tank for the SIR prototype were installed in the West Milton sphere." Note- while numerous photos of the interior of the Westinghouse / Bettis Atomic Power Laboratory STR (later S1W) prototype received fairly wide distribution by wire at the time, photos either inside or outside SIR / S1G were far less well distributed due to GE's essentially playing catch-up with this plant... Westinghouse being first got it all the glory. APR congratulates everyone at the site - these proud men and women constantly, tirelessly perform jobs that no one really ever gets to hear or know about until milestones like that reached with the 50,000th graduate come to light. Atomic Power Review is proud to present the 106th Carnival of Nuclear Bloggers - a weekly feature that rotates between a number of the best pro-nuclear blogs in the English-language blogosphere. This feature has become well known in pro-nuclear circles as the best weekly location to get a finger on the pulse of the nuclear energy world. APR Note: This week was to have been hosted at NEI Nuclear Notes, but due to a last minute problem APR has picked it up. This will explain any confusion folks may have when looking for the Carnival over at NEI's well known site. Even though it's short notice, there's no way I'm going to let you in to the Carnival without showing you some completely obscure piece of equipment and asking you to tell me what it is - hoping all the while that you do NOT skim to the bottom of the post in order to find out what it is before you've perused the Carnival entries. We consider that cheating around here. So, then, I ask you... "What is this?" You can click the picture to enlarge it. The print on the photo says "welding machine" - so if you guess "welding machine" you get nothing. What might this welding machine be for? You might be able to guess that, but I bet you won't be able to guess who manufactured this thing. Whatever the case - time to put that in the back of your mind for now and visit the 106th Carnival! Dr. Allison Macfarlane, an associate professor at George Mason University, with a PhD in Geology from MIT, has been nominated by President Obama to be both a Commissioner and the new Chairman of the U. S. Nuclear Regulatory Agency. If the President does not change his mind, that decision alone will be enough to turn me into a fervent supporter of anyone BUT Obama. If the Senate confirms Dr. Macfarlane for the increasingly important post, it will be enough to make me start investigating ways to become a citizen of another country. The NRC yearly review of Vermont Yankee gave the plant the highest marks. The NRC yearly meeting about Vermont Yankee held in Brattleboro. In contrast to the review, the meeting was a lesson in the successful politics of intimidation. The post at Yes Vermont Yankee includes a two-minute video. With the sudden departure of NRC Chairman Gregory Jaczko and President Obama's rapid nomination of Allison MacFarlane to fill the role, what does this mean for the NRC (and the nuclear industry writ large)? Ultimately, it's a mixed bag. As if Tokyo's government hasn't got enough public image problems, now they attack the findings of the World Health Organization on their estimates of the radiological impact of the F. Daiichi accident releases. What's mind boggling is WHO used the data supplied to them by Tokyo last September! So what if WHO crunched the numbers differently? uranium fuel and heavy water moderator, arranged in horizontal individual pressure tubes, thereby eliminating the need for large cast pressure vessels. CANDU quickly became Ontario's biggest energy source, out-generating all other sources combined. This domestic success was the springboard for international sales. CANDU construction projects in South Korea, China, and Rumania set the standard for multi-unit stations, based on proven designs, built on time and on budget. Steve Aplin argues that this amazing and unsung achievement is on the verge of being repeated, and all because painful but important management lessons from previous projects have been taken into account. At Nuke Power Talk, Gail Marcus follows up on her last blog on the history of the "Too Cheap to Meter" statement with further reflection on whether it is possible or desirable to have electricity that is too cheap to meter. Gail's second post was in response to numerous comments, some pointing to times and places where electricity has not been metered, or to a future where the marginal cost of electricity might be so low that metering it would cost more. She wonders, though, if people might approach electricity consumption as they do an all-you-can-eat buffet table! The resignation announcement of US Nuclear Regulatory Commission Chairman Gregory Jaczko earlier this week jolted the nuclear power industry and the ever-tumultuous political world of Washington, DC. Paul Bowersox at the ANS Nuclear Cafe lays out the reactions to the resignation and makes a foray into the popular Beltway pastime of "reading the tea leaves" regarding Chairman Jaczko's eventual successor at the NRC. What advice would you give Allison Macfarlane? At Idaho Samizdat, Dan Yurman asks readers to provide answers to the question of what they expect from the NRC Chairman's office. Assume for the sake of discussion you are an adviser hired independently by Allison MacFarlane to provide unvarnished advice on how to succeed on the job assuming she is confirmed as Chairman of the U.S. Nuclear Regulatory Commission. Nuclear Famine Fears Based on Faulty Assumptions. There was a 19 page report that claims that a billion people who are undernourished would die if there was a nuclear war between India and Pakistan. This is based on a series of wrong assumptions. Starting with the beginning that nuclear bombs would set off firestorms in Indian and Pakistan cities the way one was set off in Hiroshima. Nagasaki did not have a firestorm. Hiroshima did not have rain for 27 days prior to its bombing and they had paper and wood buildings and a high builtup coverage of land and breakfast cookers. India and Pakistan have mostly burnt brick buildings that are not as flammable. No big city fires then almost no material getting into the Stratosphere. Therefore no temperature effect. The other assumptions are also wrong. There was a temperature drop after Mount Pinotubo with 30 million tons of aerosol in the Stratosphere which had temperature effect for about two years but no impact on agriculture or starvation. There is no need to make stuff up. A full exchange of nuclear weapons between India and Pakistan would kill about 20-50 million people and injure many more. There is no need for some weird fairy tales about climate effect and then starvation. That does it for this week's Carnival entries. As we can see, a vast majority of people have been discussing Chairman Jaczko's announcement of intent to resign when a replacement is confirmed; right in step with that is discussion surrounding the nominee to replace him, Allison Macfarlane. This story is not going to go away; I'd recommend reading up on it using all the links above so that you're not left behind as the story develops. "The design and development of automatic seal welding and cutting equipment for nuclear reactors is an important activity at United. One such development involved the design and manufacture of cutting and welding equipment using consumable inserts for the U.S. Navy submarine Triton (S4G). 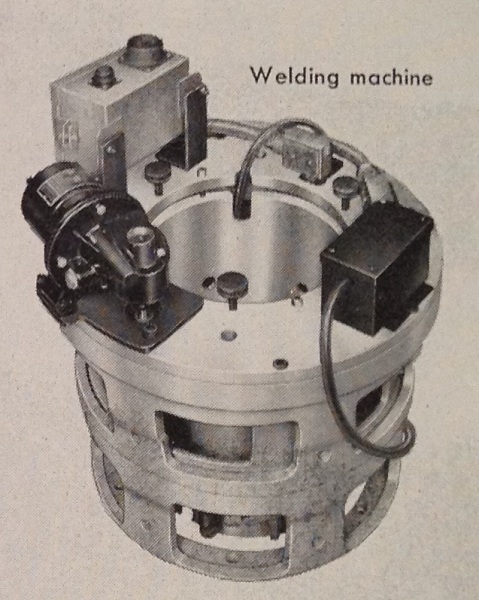 Equipment will cut and re-weld 11 inch diameter welds on the control rod drive mechanisms at various angles. A control unit provides automatic sequencing of welding operations and the design of the welding unit allows use in spaces as close as 1-3/4 inches from weld to adjacent mechanisms. Equipment can be operated with any or all control rod drive mechanisms in place and its reliability eliminates the necessity for radiographic inspection." The manufacturer name was hinted at in the text - "United." This slightly improbable contributor to the early nuclear energy industry was the United Shoe Machinery Corporation, which had an Atomic Power Department that manufactured, for the AEC, various control rod drive mechanisms and auxiliaries as shown above. Below, United Shoe Machinery's factory with logo. The above illustrations and text are from Nucleonics, May, 1959. But such trade magazines aren't the only mention of the United Shoe Machinery Corporation in APR's collection -- in fact, Admiral Rickover himself mentioned this company while making a presentation to the Joint Committee on Atomic Energy in March, 1957. 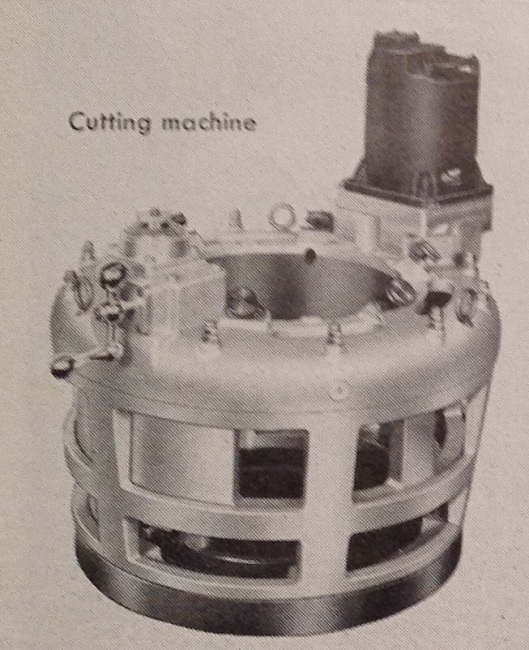 Adm. Rickover: "Here is a sample of the control drive mechanism for the radar picket submarine. It is being designed by the United Shoe Machinery Corp., of Beverly, Massachusetts." Representative Durham: "Is the shoe man in this business too?" Adm. Rickover: "The United Shoe Machinery Corp. is pretty good in developing mechanisms. You see, in the shoe business they have to use a lot of very complicated machinery. They are experienced in developing mechanisms. This gives you some idea of how we are spreading our development out." Senator Jackson: "The Russians will have a terrible time trying to figure out just what the American corporations are doing if they just read the stock lists and try to make a decision." Adm. Rickover: "That is right. We have companies such as Borg-Warner, Bendix and Aerojet making controls. We have all kinds of companies in our business." So, while at first take a shoe manufacturer might seem the most unlikely contributor to primary reactor plant equipment, in fact when manufacturing capability was compared to need (or potential need) companies such as this came right to the top, and were probably only too glad to take contracts for what appeared at the time to be a limitless future market. APR note: The "radar picket" that Rickover mentioned was in fact the USS Triton, with two S4G pressurized water reactors, also mentioned in United Shoe's advertising copy earlier. That's it for this 106th Carnival. I hope you've enjoyed it, and I look forward to next week's installment. Thanks to all of the contributors for all their effort. An interesting week, to say the least. This has indeed been an interesting week for those who follow the news in nuclear energy. Here is a brief recap from my perspective. NRC CHAIRMAN Gregory Jaczko announced this week that he would be resigning his post -- but only after a replacement was found. This announcement led to widespread glee in Republican-oriented quarters, widespread congratulation for "a job well done" in Democrat quarters, and in many minds an air of suspicion. The suspicion was that there might be something in the upcoming Inspector General's report that would force Jaczko to resign; indeed, there are further (unanswered) letters from the House Oversight Committee (in front of which the whole Commission testified not too long ago) about apparent untruths in Chairman Jaczko's testimony. Jaczko himself denies any such connection, instead indicating that it's time to move on, although that time will only come when a replacement is approved. After only a very short time was allowed for speculation, the White House announced that its nominee would be one Dr. Allison MacFarlane. I don't think we need to speculate too much on what MacFarlane brings to the table; Rod Adams interviewed her for the Atomic Podcast radio show (I've been on this show twice, folks!) and has kindly provided me with a link. Click here to hear Rod Adams' interview of Dr. MacFarlane from a few years back. We'll have to wait and see what happens in the confirmation process - but with Commissioner Svinicki up for reappointment, there's bound to be some tradeoff. (I happen to agree with one of the posters at Rod's podcast page - the White House should have picked Dr. Gail Marcus. But what do I know?) Click here for the earlier APR post on Jaczko's resignation; includes some interesting press releases. In other news, this week Westinghouse made a significant announcement that it had formed an alliance with an engineering firm, and with submarine builder Electric Boat, to work together toward winning some of the DOE funding available for SMR plant construction. With the Vogtle and Summer plant projects underway (as expected) the focus now seems to be shifting toward this chunk of DOE money, and to which consortium can best position itself to wind funding and construct actual hardware. More than one analyst, in more than one pursuit, has indicated to this author that the best bet for the next unit to be built in the United States would be an SMR and not a large commercial station - mainly for economic reasons. (That would have to mean that whichever SMR design gets built would have to be finished before TVA can complete Watts Bar 2 in order to be fully correct, by the way.) You can click here to see the APR post made on that topic this week, with lots of background. Some time ago, APR made two posts concerning a very serious fire on board a Russian nuclear submarine. Click here to read the first post, and click here to read the second. This week, unfortunately, we have another, more serious fire on a nuclear submarine to report - and this time it was ours. Apparently the fire began on board USS Miami, SSN-755, at about 5:41 PM on May 23rd. The ship was in a drydock at Portsmouth Naval Shipyard, Kittery, Maine undergoing overhaul / refit; she had been there since March. No torpedoes were on board. The reactor had been shut down for two months, and the fire never threatened any of the systems used to operate or cool the reactor plant. 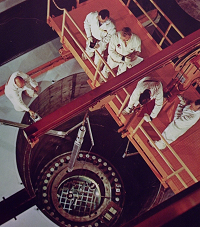 (In other words, the fire remained forward of the reactor compartment's forward bulkhead, or in other words was limited to the operations compartment.) Having said that though the fire burned for an exceedingly long time since no firefighting water was available on board; according to reports this author has read, as many as twelve civilian fire agencies were called to assist. This author believes that the fire must have gotten into hull insulation in order to burn as hot and as long as reports seem to indicate; according to WNCT CBS Channel 9 (local to the area) the compartment was isolated completely and abandoned to cool down after the fire was out, and reentry prevented to avoid reflash. Later, this morning (Friday, 5/25) the ship was ventilated for hours to allow reentry for inspection. In all seven men were injured, and thankfully all have been released. One would have to wonder if the ship can be economically rebuilt. The determining factors surely will be the cost to repair damage in the forward end of the ship (it appears that a large amount of equipment had been removed for work) balanced off against the amount of time the ship has left on its reactor core before refueling. Why do I report on these things here? Simple - because these submarines are nuclear powered. Very often the public wants to know what has happened - REALLY happened - when events like this take place. When someone with sub experience says that it's possible to isolate the forward part of the ship so that the reactor plant isn't threatened, it carries weight. (Even though there are numerous stories out there right now repeating the Navy's statement to this effect, sometimes you have to either repeat it, or echo it, one more time.) This fire of course has nothing at all to do with the fact that the sub is nuclear powered and in fact from time to time shipyard fires like this one can and do happen on any and all classes of ship. The Navy has not released a cause for the fire yet, but anyone with experience will guess one thing first - welding. That would potentially cause sparks to jump to combustible material; even though the best possible precautions are ordered, sometimes they're not taken, or sometimes something happens which is totally unforeseen. We'll wait to see whether the Navy decides to rebuild and return the Miami to service, or decommission her and send her to NPSSRP (Nuclear Powered Ship and Submarine Recycling Program) early. Finally for this APR installment... a brief Op-Ed piece by yours truly. It won't take long. The recent article posted on ANS Nuclear Cafe concerning spent fuel at Fukushima Daiichi, which cleared two rounds of peer review, and which also gained the (much appreciated) support and backing of NEI, has continued to receive a great amount of attention by anti-nuclear commenters everywhere ... and some opposition by persons claiming to be pro-nuclear as well. This is the best possible outcome; it has proven that the anti-nuclear crowd knows when it has been presented with fact rather than hyperbole and FUD (which is the anti-nuke's stock in trade) and it fights that whenever and wherever it is seen. Were it proven that the hyperbole and fear spread by paid anti-nuclear activists is based only on a few loosely associated facts, mostly misinterpreted, and strung together in a line of assumptions which taken together are so impossible as to be laughable, the anti-nuclear crowd would be minus its beloved fear .. and worse, perhaps minus its beloved FUNDING. That's right -- there's big money in being anti-nuclear. (We already know of one anti-nuclear activist "expert" that gets paid $82000 a year by a 501(c)3 non-profit; how would YOU like to be paid 82 G a year for being wrong 100% of the time?) Yep - we showed that they don't like being presented with fact. They do what they usually do, which is try to shout everything down in the comments. That's why it's important to get pro-nuclear articles out there and let the comments fall where they may. It's bad policy to try to fight to get our message out when it's buried in a string of hundreds of comments; LEAD with it and it'll get out! (And thanks to one friend, the story did get reprinted in Daily Kos where it gets even more exposure.) I hope all of us who are pro-nuclear bloggers learned something this week. I did. Press release below from Westinghouse Electric. ARLINGTON, Va., May 21, 2012 /PRNewswire/ -- Westinghouse Electric Company, Burns & McDonnell and General Dynamics Electric Boat will collaboratively team to support the Westinghouse Small Modular Reactor (SMR) application for the U.S. Department of Energy (DOE) Small Modular Reactor Funding Opportunity. Michael Anness, SMR product manager at Westinghouse Electric Company, announced the teaming arrangement today at the Platts SMR conference in Arlington, Va. "We are very pleased to welcome Burns & McDonnell and Electric Boat as members of our vendor team to support the Westinghouse Small Modular Reactor design effort, and the ultimate deployment of a Westinghouse SMR at Ameren Missouri's Callaway Energy Center," said Anness. "We feel that this collaboration is an excellent fit for the team and will tremendously enhance our capabilities to provide licensing, construction and operational certainty that no other U.S. SMR supplier applying for DOE investment funds can match." "Developing and building these next-generation reactors is a transformative opportunity to create jobs and grow Missouri's economy, and we're thrilled that Missouri-based Burns & McDonnell will be playing an important role in this partnership," Missouri Governor Jay Nixon said. "Westinghouse's application has unequivocal support from the state of Missouri, all of our electric-utility providers, labor organizations, and our powerhouse research universities. Adding a world-class engineering firm like Burns & McDonnell to the team only makes our application stronger. We are extremely pleased that Westinghouse has turned to this landmark Missouri company for this pivotal role on the architectural and engineering team." Department of Energy (DOE) SMR investment funds will be awarded to SMR projects that have the most potential and promise to be licensed by the Nuclear Regulatory Commission and achieve commercial operation by 2022. The cost-share agreements will span a five-year period and, subject to Congressional appropriations, provide a total investment of approximately $900 million, with at least 50 percent provided by private industry. Westinghouse submitted its application to the DOE last Friday, May 18, on behalf of the Ameren Missouri-led NexStart SMR Alliance. The addition of Electric Boat and Burns & McDonnell to the Westinghouse team will further support and provide additional confidence to the Westinghouse SMR Project in its pursuit of the DOE funding opportunity. Burns & McDonnell, Missouri's oldest and largest engineering firm will provide architectural and engineering support to design the power systems of the class-leading 225 MWe Westinghouse SMR. The company's more than 110 years of experience with all generation types includes an expansive and broad wealth of knowledge and expertise in new plant design, existing plant upgrades, operating plant issues, and design and analysis of myriad complex systems. Electric Boat has joined the Westinghouse-led team to provide modular design support, leveraging the expertise attained over more than 60 years of nuclear-powered submarine design and manufacturing to the benefit of commercial nuclear programs. Electric Boat's specialized expertise in modular design will facilitate the achievement of factory-build efficiencies never before seen in nuclear energy deployment. The Westinghouse SMR is a 225 MWe integral pressurized water reactor (PWR), with all primary components located inside of the reactor vessel. It utilizes passive safety systems and proven components, as well as modular construction techniques – all realized and already licensed in the nuclear industry-leading AP1000® reactor - to achieve the highest level of safety and reduced number of components required. Westinghouse believes that this proven approach will provide licensing, construction and operational certainty that no other SMR supplier can match with competitive economics. For more information about the Westinghouse SMR, visit www.westinghousenuclear.com/smr/index.htm. Founded in 1898, Burns & McDonnell is a 100 percent employee-owned, full-service engineering, architecture, construction, environmental and consulting services firm. Burns & McDonnell is currently the 23rd largest AEC firm in the Engineering News-Record Top 500 ranking. The firm is among the leaders in many categories, including the No. 2 ranked firm in the Transmission & Distribution category. With the multidisciplinary expertise of more than 3,400 professionals in more than 30 regional, national and international offices, Burns & McDonnell plans, designs, permits, constructs and manages facilities worldwide with one mission in mind: to make its clients successful. More information about General Dynamics is available on the Internet at www.gdeb.com. This move certainly puts Westinghouse on an even footing with the Generation mPower team, made up of Babcock & Wilcox and Bechtel Corporation, in the SMR market. This article in the Columbia Daily Tribune gives more background as to the alliance between Ameren and Westinghouse. Click here for a very detailed release (and separate pdf file presentation) from Ameren Missouri on the project to build a Westinghouse SMR at Callaway. Click here for a very useful and detailed APR link list on the project. Surprising news comes from the Nuclear Regulatory Commission today as NRC Chairman Gregory Jaczko has indicated that he will resign from the NRC as soon as a successor is named. Below, the text of the press release from the NRC. This announcement has been met with press releases by Senator Reid, and Congressman Markey (both Democrats) praising his tenure; by Congressman Darrell Issa (who led the quite public investigation into allegations of misconduct by the Chairman) indicating that this is a welcome change; and from the White House, diplomatically indicating that there will be fairly rapid moves to get a successor. Some organizations have also made releases; below is the text of Nuclear Energy Institute's release. “In the seven years that Chairman Jaczko has served as a member of the commission we recognized his commitment to set the highest standards for the safe operation of the nation’s 104 nuclear power plants and transparency throughout the nuclear regulatory framework. “We have had differences with the chairman on how best to achieve our mutually shared safety goals. But to his credit we’ve always had open lines of communications and a willingness to respectfully discuss the issues. This has especially been the case over the past 13 months since the accident at the Fukushima plant in Japan. We wish the chairman the best in his future endeavors. Author's Opinion: This move is probably being made at the right time. Chairman Jaczko seems quite against nuclear energy, against the discovery of a location for a nuclear waste repository, and against normal give and take committee function. With four plants under construction, a new round of SMR funding underway (and very likely operating SMR plants in the next decade or so) this is not the time to have a person with an anti-nuclear agenda at the helm of the nuclear regulator in this country. While safety is (and always has been) paramount at the NRC, it is ludicrous to think that any one Commissioner might have an upper hand in safety culture beliefs - and this is the leg Jaczko stood on to explain his behavior and decision making. It may also be no mistake that this occurs right as we get into the stretch of election season. We will have further releases here as they're made available. The 105th Carnival of Nuclear Energy Bloggers is up this week at the ANS Nuclear Cafe site, and folks - you do NOT want to miss this one. Click here to get to Carnival 105. There has been no shortage whatsoever lately of wild misrepresentation of the situation at the Fukushima Daiichi site in Japan, in particular surrounding the condition of spent fuel at the site. This Carnival delivers a thorough, well reasoned and researched counter to those opinions that seek to fan the flame of fear; several posts linked from the Carnival deliver different views of the situation including a major effort that appeared first at ANS Nuclear Cafe, and which later appeared at Daily Kos. If you've wondered what was on the minds of pro-nuclear insiders at any point all you would have to have done was to check in on the weekly Carnival, wherever it was. If you have wondered but not looked, why not start now? Those of you who have been waiting for me to say something about these many varied articles and interviews floating around the broadcast world and internet predicting doom because of the supposed shaky situation of the spent fuel at Fukushima Daiichi have completed your wait. What's significant is that I didn't say it here. You can find my latest work at the American Nuclear Society's ANS NUCLEAR CAFE site. Click here to access my article. I will immediately add that I not only consulted a number of documents to write this, but also had help in the peer review process from many great people (who are listed at the ANS page - I made sure they were not left out. I hope I got everyone.) Steve Aplin, who was not involved until the end of the process deserves mention as well as he read over the final draft in addition to the others on the list. I hope you enjoy it - and further, I hope that this kind of thing continues to head off the unwarranted fear being spread among the public by paid anti-nuclear activists who profit handsomely at the expense of your nerves. I've had the good fortune this week to have been interviewed for the second time by Fintan Dunne - a man who has a very uncanny knack for driving right through to the truth. He's extremely enjoyable just to talk to on the phone, and is a wonderful interviewer. CLICK HERE to hear the interview audio file! For listeners / readers of Fintan Dunne, I've assembled just a few fear (and lie) combatting resources. Spent Fuel Pool at 1F-4 will not collapse. Reinforcement at 1F-4 below spent fuel pool. Steve Skutnik - The Neutron Economy - A great piece on the subject titled "Overheated Rods & Rhetoric." Good, readable "real time" account of the accident in progress by my friend Leslie Corrice. Click here. I was honored to be able to peer review the book prior to completion and also provided the forward. New AREVA offer to reprocess Fukushima Daiichi spent fuel. APR post on how misinformation on nuclear energy spreads, and how we're fighting it. An APR classic! Fintan Dunne's listeners / readers should BOOKMARK this post, as I will continue to add resources to it continually. SoCal Ed 5/15 Press Release. Press release direct from SoCal Ed. Thanks to Jennifer Manfre, Senior Manager, Media Relations for SoCal Ed. ROSEMEAD, Calif., May 15, 2012 — Southern California Edison (SCE), working with a team of experts and based on its ongoing review of the extensive data collected from the steam generator tube inspection and testing that commenced at the end of January, is developing a response to the Nuclear Regulatory Commission’s Mar. 27 Confirmatory Action Letter (CAL). At all times during both the steam generator replacement process and the ongoing outages in Unit 2 and 3, SCE has provided open and transparent information to the Nuclear Regulatory Commission. The health and safety of the public and employees is the number one priority for San Onofre. As has been stated since the beginning, SCE will not restart the plant until it and the NRC are satisfied it is safe to do so. Both SONGS units of the plant are currently safely shut down for inspections, analysis and tests. Unit 2 was taken out of service Jan. 9 for a planned outage. Unit 3 was safely taken off line Jan. 31 after station operators detected a leak in a steam generator tube. Nineteen percent of the power SCE customers use comes from nuclear generation. SCE is also working with the California Independent System Operator and San Diego Gas & Electric on power supply contingency plans for this summer should the San Onofre Nuclear Generating Station not be fully operational by then. More information is available at www.edison.com/songsupdate. Press release on formation of NuSource LLC follows. Alexandria, VA (May 15, 2012) - MPR Associates Inc. signed an agreement with Gavial Holdings, Inc. to create NuSource, LLC, a joint venture company dedicated to providing integrated, end-to-end engineered and manufactured solutions for obsolete components to the nuclear industry. NuSource combines MPR's world class engineering expertise in design & licensing bases, plant operations and maintenance, and configuration control program requirements with Gavial's best-in-class fabrication and manufacturing capabilities under the requirements of 10CFR50, Appendix B. Through this unique and comprehensive combination of nuclear engineering and manufacturing expertise, NuSource delivers turn-key, engineered solutions for nuclear safety related equipment and components to the commercial nuclear industry. "NuSource will function as a one-stop shop for nuclear equipment related to safety and reliability," states MPR's Principal Officer Robert Coward. "By working with its [NuSource] customers to understand the needs for each situation, to examine each replacement alternative, and to define all applicable design and licensing bases requirements, NuSource will be able to provide the best solutions that resolve obsolescence issues within the framework of the plant owner's engineering, procurement, and maintenance programs and consistent with business plan objectives." MPR possesses nearly 50 years of experience in creative engineering solutions and successful management of projects for nuclear power clients and Gavial has over 30 years of experience in the high-quality manufacturing of safety, and non-safety related instrumentation & controls as well as fabricated mechanical equipment. "Both Gavial and MPR are thoroughly committed to ensuring NuSource's success," commented Don Connors, CEO of Gavial. "MPR's well-established experience with engineering of nuclear component's and Gavial's proven experience with manufacturing nuclear hardware complement each other and make us exceptional partners for one another." NuSource is headquartered in Alexandria, VA.
To learn more please visit, www.nusourcellc.com. Click here to access Gavial Holdings' web page. Click here to access MPR Associates' web page. 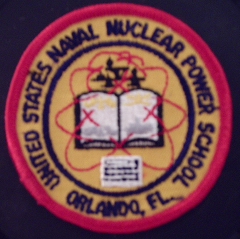 Atomic Power Review is proud to host the 104th Carnival of Nuclear Bloggers this week. As Rod Adams has pointed out, the marking of 104 editions means that the Carnival is at this time at the two year anniversary point. It's easy to see, given both the growing participation in the Carnival by bloggers and the growing readership that three and four and more years will easily be made. Congratulations from APR to all the bloggers who have made this anniversary possible! And now for the... oh, wait a minute. Before we go on... What is this? This is a piece of artwork depicting a plant pre-construction. Click to enlarge the photo, and you'll see the letters "RG&E" on the plant. Any ideas? The answer after the Carnival entries! In the power system marketing wars, both nuclear fission and natural gas are currently labeled as “low carbon” sources of electricity. Even though nuclear fission reactors can be clean enough to run inside sealed submarines, the forces who oppose nuclear energy insist that there is enough CO2 produced in the fuel cycle and in the plant construction processes to prevent the use of the term “zero carbon” in any marketing literature. It is time to take a page from the American Petroleum Institute (API) and start branding nuclear energy as "ultra low carbon" power. We need to emphasize the difference between an average nuclear plant lifecycle emission 17 grams/kilowatt-hour and a minimum of 400 gms/kilowatt hour at a plant burning natural gas. The situation at San Onofre is getting worse. First, Ron Litzinger, President of Southern California Edison (NYSE:EIX), which owns and operates the twin 1,100 MW nuclear reactors, told California's electricity grid operator Unit 2 may be back online by June 1 and Unit 3 up by June 12. Second, that announcement brought a response in the form of a terse statement from NRC Chairman Gregory Jaczko who said the utility has not submitted any documents for the agency to review "so any discussion of a date for the restart of Unit 2 or Unit 3 is clearly premature." Third, Rep. Darrell Issa (R-Calif), who's district includes the shut down reactors, released a letter raising the question of whether Jaczko lied to the House Oversight Committee last year. The timing of the letter is not a coincidence. Once upon a time an ailing king abandoned one of his castles. He said it was too expensive to keep up more than one court. Besides, the peasants weren’t bringing in the sheaves, which made the whole kingdom’s economics shaky. Then a new king arose, who was wiser in the ways of castle upkeep. Except things have not exactly worked out that way for TVA at Watts Bar 2. As an aside, APR has a press release on San Onofre available HERE. Click here to get to The Hiroshima Syndrome - Fukushima Accident Updates. Two updates as delineated below. 1. (May 11) Apocalyptic fantasy gets headlines in Japan - Gundersen and Alvarez' speculations of world-wide doom from F. Daiichi's #4 SPF haave garnered headlines with Japan's #2 newspaper, Asahi Shimbun. The Asahi summarily rejects Tepco denials because they are less trustworthy than politicians (you read that correctly!). I argue that since former PM Kan has resigned and his mandate of all Tepco communications coming through his office has gone away with him, TEPCO's communications have essentially stood the test of time. 2. (May 9) Get it right, for crying out loud! - A Mainichi Shimbun editorial (Q&A format) has some serious number problems. Their decay heat estimates (% of full power)are too high by as much as a factor of 20. They owe it to their readers to post a correction...which they probably won't. China plans to have a 5 megawatt (MWe) thorium molten salt reactor by 2015. The China Academy of Sciences in January 2011 launched a program of R&D on thorium-breeding molten-salt reactors (Th-MSR or TMSR), otherwise known as Liquid Fluoride Thorium Reactor (LFTR), claiming to have the world's largest national effort on these and hoping to obtain full intellectual property rights on the technology. A 5 MWe MSR is apparently under construction at Shanghai Institute of Applied Physics (under the Academy) with 2015 target operation. The Navy is funding EMC2 an additional $5.3 million over next 2 years to work on the problem of pumping electrons into the Polywell. Big new pulsed power supply to support the electron guns (100+A, 10kV). WB-8 has been operating at 0.8 Tesla (8 times stronger magnetic field than any previous version). "Congressional debate over terms of future 123 agreements"
Jim Hopf at the ANS Nuclear Cafe assesses the pros and cons of H.R. 1280. This bill being debated in the US House of Representatives would impose similar conditions on future "123 agreements" (concerning transfer of nuclear technology) as in the recent 123 agreement between the US and UAE (i.e., foregoing all rights to enrich uranium, to reprocess spent nuclear fuel, etc.). Would H.R. 1280 be good policy? The debate has significance since several more 123 agreements will be considered in the near future with nations such as Vietnam, Jordan, and possibly Saudi Arabia. Some of these nations (e.g., Jordan) have significant uranium reserves that they may desire to exploit someday, which may make them reluctant to give away any future enrichment rights. "Replacing nuclear with wind power: Could it be done?" Many people would like it to be theoretically possible to replace nuclear power with wind power. Could an intermittent source [wind] replace a baseload source [nuclear] for producing electricity? It turns out that this question really has nothing to do with *how* the electricity is generated, but everything to do with *when* the electricity is generated. Dr. Ulrich Decher at the ANS Nuclear Cafe uses analogy to "drive home" the important concepts of capacity, capacity factor, and generation. Margaret attended an NRC public meeting on construction of a laser enrichment facility, and describes in detail her reactions to what went on - and it seems she was pleasantly surprised! At Nuke Power Talk, Gail Marcus recaps the history of the phrase "too cheap to meter" that has haunted the industry for so many years. She was spurred to write on this topic this week by her husband, Mike Marcus, who writes a blog on telecommunications issues. After their recent stay in a hotel in Phoenix where they had free long-distance phone calls, Mike concluded that maybe Lewis Strauss should have said that telecommunications would become too cheap to meter! Gail links to Mike's blog so the historical evolution of pricing in the two industries can be contrasted. The Vermont legislature has gone home for the year, but managed to have some stunning reversal about energy before it went home. The Vermont legislature was about to pass a law ordering the Public Service Board (PSB) to make sure certain money went to the ratepayers in an upcoming utility merger. Governor Shumlin objected. He claims that the legislature should not intervene in an open PSB docket or it would be overstepping its bounds. Meredith Angwin notes that in 2010, Shumlin used a legislative vote to prevent the PSB from granting a Certificate of Public Good to Vermont Yankee. She has some cynical things to say about how Shumlin lines up his legislative ducks. That does it for this week's Carnival entries. All that's left is to tell you what that was you saw at the beginning! 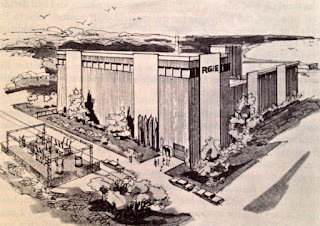 The illustration I presented was an initial sketch design showing the exterior of a High Temperature Gas-cooled Reactor (HTGR) which Rochester Gas & Electric proposed to construct in the state of New York. The design was submitted as a proposal to the AEC in response to a February 1964 request for proposals for a variety of advanced reactor designs, including high temperature gas cooled reactors. 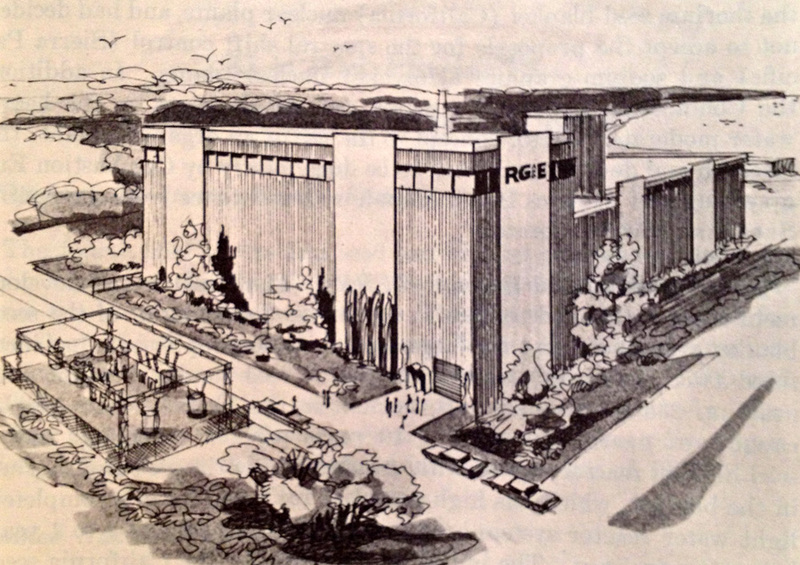 RG&E proposed to construct an HTGR plant as shown at a site about 19 miles east of Rochester, New York - the other participant in the proposal was the reactor vendor for the plant, namely the General Atomic Division of General Dynamics Corporation. The plant was to have produced 260 MWe; under the proposal General Atomic would furnish the entire power plant and all the nuclear fuel - surely the ultimate in early nuclear power era "turn key" contracts. This plant was never built. Details of the cancellation are not clear, but what is clear is that in 1965 RG&E ordered a two loop pressurized water reactor plant from Westinghouse for this same site, rated 420 MWe. The plant received a construction permit from the AEC in April 1966, and received its operating license in September 1969 at a total cost (according to WASH 1174-71) of roughly $65 million. The plant remains in operation today. 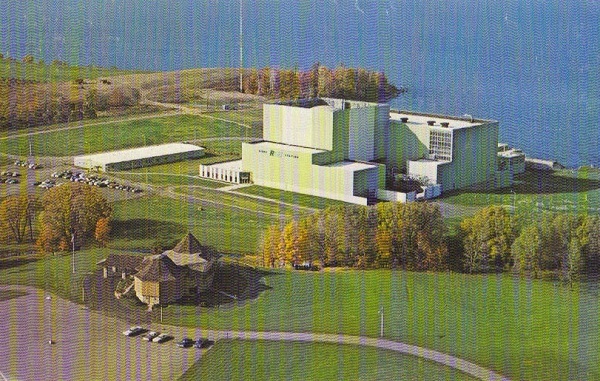 Below, from APR's files, an old original post card view showing this plant - the R. E. Ginna Nuclear Power Plant - as it looked near the time it was built, with visitor center visible as well. Ginna is fairly unique (for PWR's) in that the reactor containment is surrounded externally, separately by a facade that makes the profile match that of the rest of the building from ground level - but the containment can be seen inside the squared walls easily in this view. That does it for this 104th / Two Year Anniversary Carnival. I hope you've enjoyed it. Press release from Babcock & Wilcox below. CHARLOTTE, N.C.--(BUSINESS WIRE)--May. 9, 2012-- The Babcock & Wilcox Company (B&W) (NYSE:BWC) announced today that its subsidiary Babcock & Wilcox Nuclear Operations Group, Inc. (B&W NOG) has received a $130 million contract for nuclear reactor components based on recent technological advances that will be used on the U.S. Navy’s Virginia-Class submarines. The award is in addition to previously announced contracts under which the Company is currently providing similar products and services. Work will be performed at B&W NOG’s Lynchburg, Va., facility over a five-year period, beginning immediately. B&W NOG offers a complete range of nuclear components and services, including the manufacture of nuclear reactor components for U.S. Naval submarines and aircraft carriers and other nuclear and non-nuclear R&D and component production. The organization employs more than 3,900 people with operations in Virginia, Ohio, Indiana and a subsidiary in Tennessee. B&W cautions that this release contains forward-looking statements, including statements relating to the performance and timing of the nuclear reactor components contract. Forward-looking statements involve a number of risks and uncertainties, including, among other things, delays or other difficulties in executing contracts. If one or more of these or other risks materialize, actual results may vary materially from those expressed. For a more complete discussion of these and other risk factors, please see B&W’s filings with the Securities and Exchange Commission, including its annual report on Form 10-K for the year ended December 31, 2011. B&W cautions not to place undue reliance on these forward-looking statements, which speak only as of the date hereof, and undertakes no obligation to update or revise any forward-looking statement, except to the extent required by applicable law. Through horrendous oversight, I've not until now posted the fact that the 103rd Carnival of Nuclear Bloggers is at Yes Vermont Yankee and is one heck of a Carnival. Click here for Carnival 103! Every week this rotating feature gives the best the pro-nuclear blog world has to offer, and as is pointed out on this particular episode the presentation this week is quite exceptional. Make sure you check it out. PRESS RELEASE direct to APR reproduced below. Thanks to SCE and ISO for this information. 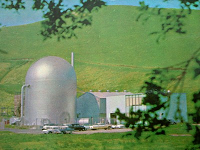 ROSEMEAD and FOLSOM, Calif., May 8, 2012 — Southern California Edison (SCE) and the California Independent System Operator Corporation (ISO) seek to clarify media statements with regard to the restart of the San Onofre Nuclear Generating Station (SONGS). SCE and the ISO have maintained throughout the SONGS outage that nuclear safety has no timeline and the units will only be returned to service when SCE and the Nuclear Regulatory Commission (NRC) are satisfied it is safe to do so. SCE has not filed a request with the NRC seeking to restart the plant. Recent media reports referred to June dates for the restart of Units 2 and 3 at SONGS. However, those dates were provided by SCE to the ISO as a purely administrative matter in March of 2012 because, for long-range planning purposes, ISO requires an estimated return to service date to be posted. These dates are for planning purposes only and are subject to change. “We want to clarify the use of planning dates and make sure it is clear that there is no timeline on nuclear safety,” said SCE President Ron Litzinger. SCE continues to do causal analysis and develop repair and corrective actions plans. When SCE is satisfied it can return the units to service safely, it will submit these plans to the NRC. Both units of the plant are currently safely shut down for inspections, analysis and tests. Unit 2 was taken out of service Jan. 9 for a planned outage. Unit 3 was safely taken off line Jan. 31 after station operators detected a leak in a steam generator tube. The California ISO operates the state’s wholesale transmission grid, providing open and non-discriminatory access supported by a competitive energy market and comprehensive planning efforts. Partnering with about a hundred client organizations, the nonprofit public benefit corporation is dedicated to the continual development and reliable operation of a modern grid that operates for the benefit of consumers. The ISO bulk power market allocates space on transmission lines, maintains operating reserves and matches supply with demand. It's been some time since I've provided detail about the situation of nuclear energy in Japan - mostly because the situation, other than the continued shutdown of all remaining nuclear plants for inspection (so far with no restart permission) has been very quiet. Indeed, events here (in particular the steam generator problems at San Onofre) have dominated attention. Having said this there have been a few things that have cropped up behind the scenes over the past several weeks - I've received many e-mails about a number of situations at the Fukushima Daiichi site that are being spread by uninformed media sources who don't vet or fact check their sources. One of these which is gaining wide traction is the myth that the spent fuel pools at Fukushima Daiichi are a real danger, particularly that at 1F-4. This is not the case. In a move that can only be described as a clear response to these simmering stories that seem not to go away, Tokyo Electric Power Company has constructed what essentially amounts to a "mythbuster" page. You can click here to see it. 1. The spent fuel pool at 1F-4 is not in any danger of collapse, even in event of another earthquake. 2. The reactor buildings will not collapse even in event of another earthquake. 3. Even though 1F-2 has a lower than expected water level in the primary containment, the plant is presently safe. 4. At no time did TEPCO consider abandoning the 1F nuclear generating station site. I will point out that the next issue was correctly analyzed on this site immediately - long before any other media believed it. 5. Rising temperatures in February at 1F-2 were due to failed equipment. There are a couple of other issues addressed at this page, but those above listed in 1 through 4 are those that keep getting new life through the work of paid anti-nuclear activists, often funded by 'environmental' non-profit organizations. Further ridiculous hyperbole about the supposed ability of materials at the site to cover the earth in event of specified or yet unspecified further imaginary disaster is sheer rubbish - if events such as the rougly 10 megaton Ivy Mike shot and the 15 megaton Castle Bravo shot set off during the years of atmospheric nuclear weapons tests didn't spread "nuclear death" all over the planet (and neither did the numerous other multi-megaton shots we set off - and the Soviet Union set off) then nothing that can occur at Fukushima Daiichi can do that either. It hasn't and it won't. ONE OTHER item that we might mention under "Nuclear Energy in Japan" has not to do with nuclear plants built in Japan, but rather nuclear plant components exported. Meredith Angwin recently made a highly popular guest post here at APR which followed another popular post on the steam generator situation at San Onofre Nuclear Generating Station in California. Meredith predicted, in that post, that derating the plants would be the most likely course of action but that the plants would both start up again. News over the last 48 hours has indicated just exactly that set of events will occur - SoCal Ed will apply to the NRC to restart the plants and operate them at a reduced power level for a testing period, after which they will be shut down and reinspected. Of course, at the center of this problem (and the relation to Japan) is the fact that the steam generators were built in Japan by Mitsubishi Heavy Industries, are supposed to be improvements over the previous generators, and of course are warrantied. Not too much of a concrete manner has yet come out about who will pay a total of what, for what, but we can all bet that SoCal Ed would like to recoup much of its operating losses - and costs for the replacement work - from Mitsubishi, who apparently didn't guarantee any warranty coverage for outage (lost power generation revenue) on this job.. so far as this author can discern from reports at this time. Of course, Mitsubishi might claim (and would hope to prove) that SoCal Ed operated the steam generators outside guaranteed (and thus warranty covered) parameters, while SoCal Ed would hope to prove that it operated the equipment exactly as specified and agreed to and that no operations it performed were outside the agreed performance parameters of the equipment as specified and ordered. These are sensible speculations on the part of this author and don't represent anything official from SoCal Ed or from Mitsubishi. For information on how SoCal Ed tests steam generators, click here. This set of events is likely to become highly involved, in a technical sense, moreso and more widely printed than heretofore and APR will continue to keep up on events. And continue to consult Meredith Angwin and her band of experts as required. Note: Previously APR carried a press release from SoCal Ed on a new seismic study being performed for San Onofre Nuclear Generating Station. Click here to see a new fact sheet from SoCal Ed on seismic testing. Very often it happens around here that I pile up a number of links that I have been meaning to publish on APR so that the greater pro-nuclear world can get a look at them. I've hit that time where I need to start getting some of these out; today I'll start with three. The first two are actually very new pro-nuclear blog sites, which of course is good news to all of us who are pro-nuclear bloggers. It means that we have not yet reached that 'critical mass' point at which more pro-nuclear blogs are superfluous. The first one was actually featured in the 100th Carnival of Nuclear Bloggers, and is called "ENTREPRENUCLEAR." The author of this blog keeps his ID quiet - many on the inside do - but seems to have a unique approach to promoting nuclear energy. Next, Colin Megson has a brand new blog covering the LFTR field - and thorium fuel is beginning to get a fair amount of play again in theoretical discussions. That fact alone probably makes watching this blog important. Finally, a commercial site. An excellent commercial site - probably one of the best I've ever seen. The presentation, the content, the style - and especially the photography - are absolutely world-class. This is one of the finest commercial nuclear sites that I have ever seen; some of the photos in the gallery are stunning, and I actually have selected a number to use as backgrounds (wallpaper) on my laptop. Anyone associated with a commercial site - and by that I mean a site owned and run by a business associated in some way with nuclear energy - should see this site. What is most interesting is that it's the site of Bulgaria's only nuclear power station. The photo gallery is an absolute must see. The artwork on the side of the training complex building, in some sort of Soviet style modernist form is just wonderful. Better still are some of the internal plant views - and tops are the views showing the environs of the plant site. There is a great deal to see on this site - leave yourself a half hour or more! The 102nd Carnival of Nuclear Bloggers is up at Brian Wang's NEXT BIG FUTURE site - and it's quite a variety piece. Very worth seeing. Every week the Carnival appears at a different pro-nuclear site .. and I highly suggest anyone interested in what the pro-nuclear world is saying keep following the Carnival on its travels.